Dr. Sayre Greenfield, Professor of English at the University of Pittsburgh at Greensburg, has received the 2012 CRL Primary Source Award for Teaching for his course on the History of the English Language. His course requires undergraduate students to conduct original research using primary source material that has been made available online. 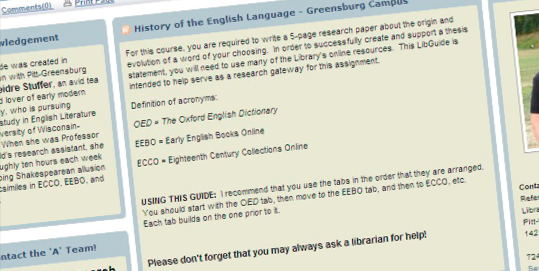 Detail of online guide to assist students in Dr. Sayre Greenfield’s History of the English Language (ENGLIT 1552) course. In this course, students learn about all facets of the development of the English language, including grammar, phonetics, spelling, and geography. The course culminates in a research paper that addresses the evolution of a single word of each student’s choosing. 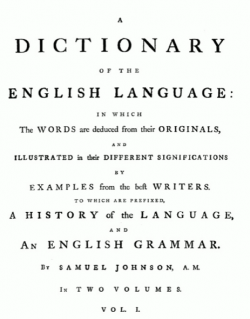 This paper requires the students to use online library resources containing primary source material, including the Oxford English Dictionary Online, Early English Books Online, and Eighteenth-Century Collections Online, in order to discover how the word and its usage have changed over several centuries. The purpose is for the students to analyze the actual texts to determine how words evolve, rather than relying on secondary literature written by scholars. The word thread derives from the pre-Germanic hypothetical root verb þræ-, meaning “to twist, from which pre-Germanic noun tretus derives. This form turned into Old Germanic þræ-ðu. This became Old English þræd and ðred, first recorded in about 725 AD. This word is cognate with such words in other Germanic languages as Old Low German þrad (hypothetical), which later became Middle Dutch draet and modern Dutch draad. Old English þræd and ðred are also cognate with Old Norse þraðr, which became modern Danish traad and modern Swedish tråd. In Middle English, spelling varied from þræd, to þred, to threed and thred. By the 1500s, spelling such as threede and Scottish dialect threid had emerged, but the modern spelling of thread was in existence by Middle English, and it became the only spelling in standard English after the 1700s. 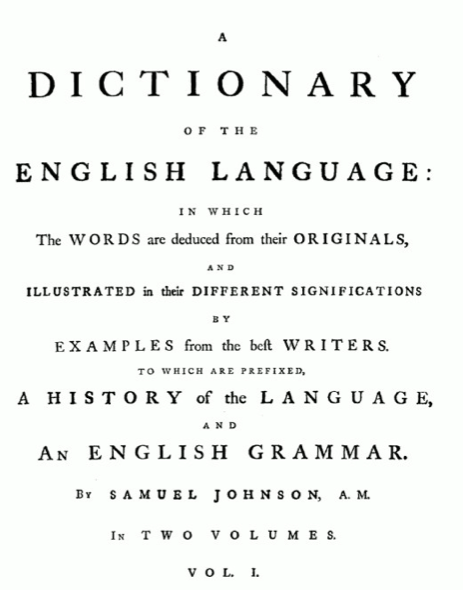 Samuel Johnson’s 1755 dictionary is among the earliest sources students are asked to consult for their word research. For their final paper, Greenfield encourages students to pick a word that is either common or, if less common, a word with an interesting history of development and has changed meanings significantly (although he cautions that he has already seen several papers on the word “gay,” for example). He requires several examples of the word pulled from Early English Books Online and Eighteenth-Century Collections Online, as well as other library reference sources such as Cassell’s Dictionary of Slang (1998), or the Harper Dictionary of Contemporary Usage (1975). The goal is that these examples will enable students to draw conclusions from the patterns of word use these instances collectively reveal. For the majority of the students, the type of research required to successfully complete the final paper is unfamiliar territory and may be among their first uses of primary source material. An online libguide offers help from university librarians and more background material regarding these sources.